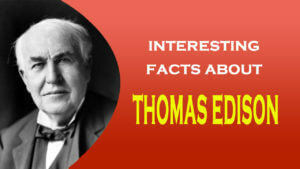 Thomas Alva Edison was born on February 11, 1847 in Milan, Ohio; the seventh and last child of Samuel and Nancy Edison. Edison had very little formal education as a child, attending school only for a few months. He was taught reading, writing and arithmetic by his mother, but was always a very curious child and taught himself much by reading on his own. This belief in self-improvement remained throughout his life. Edison began woking at an early age, as most boys did at the time. At thirteen he took a job as a newboy, selling newspapers and candy on the local railborad that ran through Port Huron to Detroit. He seems to have spent much of his free time reading scientific, and technical books, and also had the opportunity at this time to at this time to learn how to operate a telegraph. By the time he was sixteen , Edison was proficient enough to work as a telegrapher full time. He received his first patent on an electric vote recorder, a device intended for use by elected bodies such as Congress to speed the voting process. This invention was a commercial failure. Edison moved to New York City in 1869. He continued to work on inventions related to the telegraph, and developed his first successful invention, an improved stock ticker called the “Universal Stock Printer”. For this and some related inventions Edison was paid $40,000. This gave Edison the money he needed to set up his first small laboratory and manufacturing facility in Newark, New Jersey in 1871. During the next five years, Edision worked in Newark inventing and manufacturing devices that greatly improved and manufacturing devices that greatly improved the speed and efficiency of the telegraph. In 1876 Edison sold all his Newark manufacturing concerns and move his family and staff of assistants to the small village of Menlo Park, twenty-five miles southwest of New York City. Edison established a new facility containing all the equipment necessary to work on any invention. This research and development laboratory was the first of its kind anywhere; the model for later, modern facilities such as Bell Laboratories, this is sometimes considered to be Edison’s great invention. Here Edison began to change the world. The first great invention developed by Edison in Menlo Park was the tin foil phonograph. The first machine that could record and reproduce sound created a sensation and brought Edison international fame. Edison toured the country with the tin foil photograph, and was invited to the White House to demonstrate it to President Rutherford B. Hayes in April, 1878. Edison next undertook his greatest change, the development of a practical incandescent, electric light. Edison’s eventual achievement was inventing not just an incandescent electric light, but also an electric lighting system that contained all the elements necessary to make the incandescent light practical, safe and economical. After one and a half years of work, success was achieved when an incandescent lamp with a filament of carbonized sewing thread burned for thirteen and a half hours. The first public demonstration of the Edison’s incandescent lighting system was in December, 1879, when the Menlo Park laboratory complex was electrically lighted. The success of his electric light brought Edison to new heights of fame and wealth, as electricity spread around the world. Edison’s various electric companies continued to grow until in 1889 they were brought together to form Edison General Electric. Despite the use of Edison in the company title however, Edison never controlled this company. The tremendous amount of capital needed to develop the incandescent lighting industry had necessitated the involvement of investment bankers such as J.P. Morgan. When Edison General Electric merged with its leading competitor Thompson-Houston in 1892, Edison was dropped from the name, and the company became simply General Electric. This period of success was marred by the death of Edison’s wife Mary in 1884. Edison’s involvement in the business end of the electric industry had caused Edison to spent less time in Menlo Park. After Mary’s death, Edison was there even less, living instead in New York City with his three children. A year later, while vacationing at a friends house in New England, Edison met Mina Miller and fell in love. The couple was married in February, 1886 and moved to West Orange, New Jersey where Edison had purchased an estate, Glenmont, for his bride. Thomas Edison lived here with Mina until his death. When Edison moved, to West Orange, he was doing Experimental work in makeshift facilities in his electric lamp factory in nearby Harrison, New Jersey. A few months after his marriage , however, Edison decided to build a new laboratory in West Orange, less than a mile from his home. Edison possessed the both the resources and experience by this time to build, “the best equipped and largest laboratory extant and the facilities superior to any other for rapid and cheap development of an invention”. The new laboratory complex consisting of five buildings opened in November, 1887. A three story main laboratory building contained a power plant, machine shops, stock rooms, experimental rooms and a large library. Four smaller one story buildings built perpendicular to the main building contained a physics lab, chemistry lab, metallurgy lab, pattern shop and chemical storage. The large size of the laboratory not only allowed Edison to work on any sort of project, but also allowed him to work on as many as ten or twenty projects at once. Facilities were added to the laboratory or modified to meet Edison’s changing needs as he continued to work in this complex until his death in 1931. By the 1890s, Edison began to manufacture phonographs for the both home, and business use. Like the need electric light, Edison developed everything needed to have a phonograph work, including records to play, equipment to record the records and the machines. The development and improvement of the phonograph was an ongoing project, continuing almost until Edison’s death.